Early afternoon at Wantage Road and the talk was all about the pink ball as the historic first round of Championship day-night fixtures got underway, but Ben Duckett stole the show, cracking his first century of the season inside the first session. 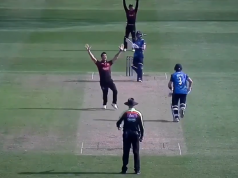 This was county cricket’s step into the unknown this week and whilst Northants v Leicestershire might not have provided the headline fixture of the round, it provided an intriguing first day. The opening session saw Duckett crack 20 boundaries on his way to a better than a run a ball cetnury, and ended with Leicestershire deploying two nightwatchmen as the hosts’ bowlers found plenty of assistance as the lights took over. It all meant that it was Northants, fresh off four victories in their opening six games, ended the day in the ascendancy as despite collapse from 211-3 to 261 all out they made the most of the twilight conditions to reduce the visitors to 65-4. A bumper, by Wantage Road standards, crowd turned up to see the action, but numbers peaked at around 5pm before thinning out throughout the duration of the final floodlight session, a trend seemingly repeated across the country. Duckett was the only man on Northants staff with experience of the pink ball, having played for the MCC in in the Champion County match, and said English contitions gave a different expereince. “It was very different to here to playing in Abu Daubi, that twilight period and the darkness changes a lot over there, after the twilight it was pitch black which is very difficult to pick up,” he said. “So it wasn’t quite as hard but it’s much different batting at 2pm than it is at 9:30pm. “In a way [the collapse] might have worked for us as it’s very tough batting under the lights, we didn’t properly cash in but, with them at 60-4, if we start well we’ll be right in it. Duckett was county cricket’s man of 2016, winning almost as many accolades as hundreds he’d hit throughout the campaign, but after a challenging winter and stuttering campaign so far, the pink ball brought out the Duckett that burst onto the scene in such spectacular fashion. Seventeen boundaries were hit by the 22-year-old inside the first hour alone, 12 of which on the way to a half century off 41 balls, as the pink nut disseapred to all corners of Wantage Road, Duckett going on to bring up his century in the final over before lunch, the 4pm interval still officially called so, to visable relief. “It took a little bit longer than last year but felt good to get there,” he said. “I think everyone would have seen how much this one meant. Duckett’s innings was part of a Jekyll and Hyde performance from Northants with the bat, as Max Holden played second fiddle with a composed but equally impressive knock from the teenager. 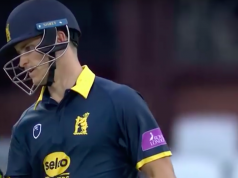 The Middlesex loanee lacked support, Rob Keogh’s 25 the only other score of note, as Northants at once stage lost four wickets in 11 balls for one run, Dieter Klein taking 6-80 as the last seven wickets fell for 50. However being bowled out shortly into the final session gave Northants 25 overs with the new pink ball as the lights gradually started taking over, with conditions definitely favoring the bowlers much more than earlier in the day. 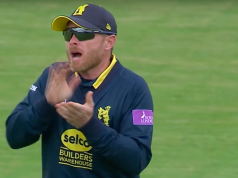 Paul Horton and Arun Harinath fell before the score reached 14, and when Mark Cosgrove fell, Leicester opted for not just one nightwatchman, but when Rob Sayer was bowled by Azharullah with five overs left, a second in Clint McKay walked to the middle. He, along with Colin Ackerman survived under the end, but only just as final ball of the day saw the former edge Richard Gleeson to Chesney Hughes, who had earlier been dismissed first ball, only to see the chance shelled, as the curtain came down on the first day of county cricket’s step into the unknown. Next articleCraig White on the pink ball: "It doesn't sound like a cricket ball"